Ptch can be used as an application for your smartphone (at this time only available for iPhone) and it is integrated with a lot of remix-capabilities. 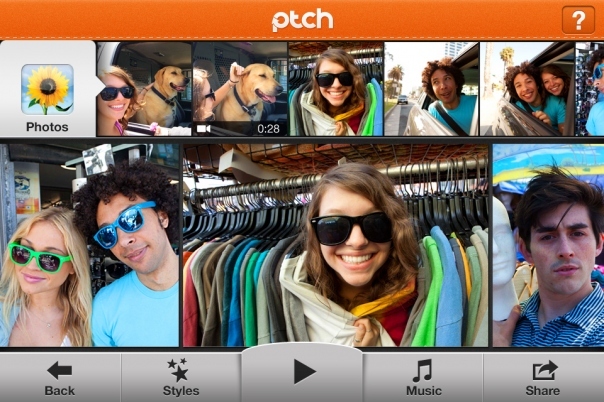 The application gives you the chance to create new (social) videos called Ptches. You can use “all” of your (social) media content (also as a login) and create a (new) story with it. Check out this video for more information on this app. It allows you to reinterpret a Ptch, to reevaluate an event/story and (re) create your own version of a story. With the increase of online editing tools, applications and platforms, remixing is more and more becoming a mainstream practice. But re-presenting content by remixing ‘old’ social media content and allowing others to reinterpret that material is quite a fresh approach to social media. Is the idea of community for Ptch really necessary? Does this platform offer something that people are really looking for? Leonard explains that Ptch doesn’t claims to be competing with other social media. Ptch sits as a dashboard across all of your social media, so we’re not trying to compete or take the place of what you use today—we’re really trying to make that more powerful and more expressive. But why isn’t sharing on YouTube possible? And why is it just an App for your mobile phone (iPhone)? And why is it not an application for your browser on your pc? To give a clear answer on this we must first look at the potential alternatives/competitors of Ptch. At first sight, one must admit that applications and media platforms like Pinterest, Instagram, YouTube and Animoto come to mind. 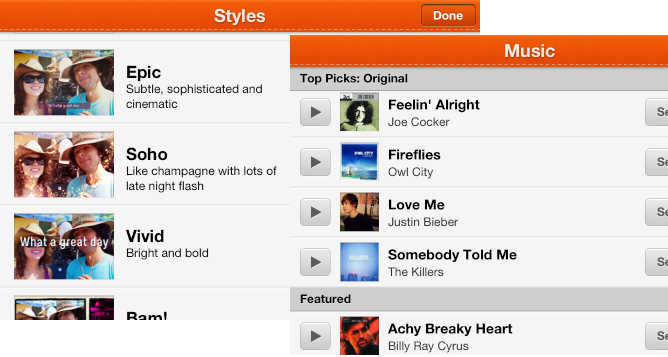 Ptch seems to have taken the visual layout from Pinterest as an example. 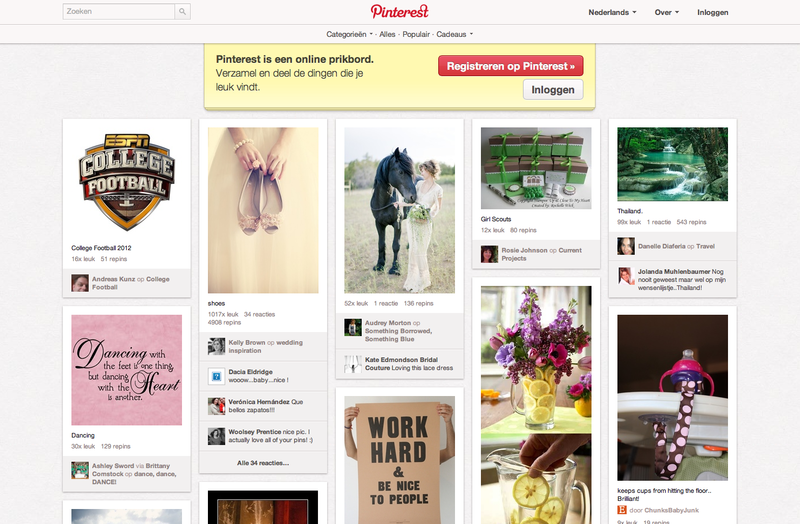 Though it visually appears related to Pinterest, there are some differences. Unlike Pinterest, Ptch has a closed community with recommended ‘creations’, there are no categories available, nor are there ‘boards’ like Pinterest. In the future, if the community grows, it will be hard(er) to find certain content. On the other hand, Pinterest does not have any remix-functionality. A platform that does offer audio and video remixability is YouTube. In january 2012 YouTube launched the YouTube video Editor. This web-based video editor enables users to carry out editing processes without purchasing, downloading or installing software onto their devices. The editor can be used to edit your own material and the material from YouTube’s archive. Both YouTube and Ptch offer editing functions to the ProdUsers and the content can be shared with the community. Unlike Ptch, the YouTube video Editor allows ProdUsers to use YouTube content and Creative Commons material. But, Ptch has a trick up its sleeve. Similar to Hipstamatic and Instagram, Ptch offers prefabricated styles and filters. A stylized way of presenting (and restyling) your material. Another web-based editor that presents this option is Animoto. With Animoto, one is able to combine photos with videos and audio (from the users own collection). By using predefined templates for the video and transition effects, users are able to create the video style they find the most suitable for their video. However, Animoto lacks the possibility to use remixed elements of an already existing video, and there is no Animoto-community whatsoever. Just to give you an idea about the “full” spectrum of creative possibilities, Ptch offers nine types of styles. Here it seems like Ptch gives you a certain choice but in fact your choice is limited into (just) 9 styles. The users on Ptch have other limited sharing possibilities. As said before, sharing your video on Youtube isn’t possible. Thereby you have a limited choice of music and the music availability determined by country (based on sign-in). Why isn’t there an option to pull music from royalty-free music sites that feature independent bands and labels? For example, YouTube offers this solution in their video editor. A third limit is the video time on Ptch. You have a 60 second limitation for your video, for larger projects, you must search for other more suitable apps. Perhaps the YouTube video editor.. This illustrates the limits of the contemporary remix culture. In concept the ‘infinite mashable’ idea of Leonard is an utopia for potential users that would like to remix their own content but in practice issues like ownership, copyright limitations, censorship (used photo/video files) seem to preclude this. “We don’t want to be a tool,” Leonard says. “We want to be a platform for self expression”. This idea might be actually limit Ptch in their own success. The aspect of the remixing with other video elements from other people of the Ptch community makes this community quite unique. But Ptch is in a way a ‘closed’ community because it is not integrated very well into other social media. This walled garden approach could eventually be a downside for the use/popularity of Ptch and keep the ‘other’ social media users away. Ptch might consider focusing less on ‘their’ community and some more on ‘other’ communities and their application. Restrictions in duration, music and styles are limiting the ProdUsers in their creations. Another downside is the absence of a web-based application. Both YouTube and Animoto found ways to bypass some of these limitations. Ptch could learn from these platforms and adapt. 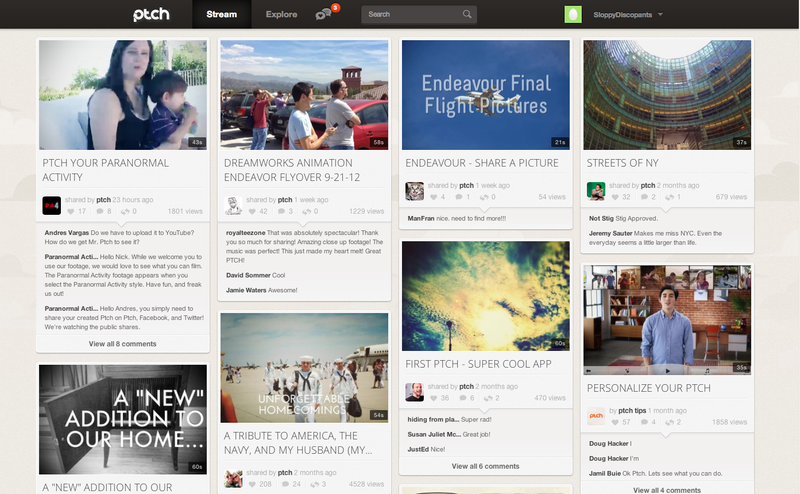 Overall, Ptch is a very interesting step towards (social) remix-culture. Incorporating various elements of other successful applications and platforms has lead to a refreshing new application/platform. But by restricting its users community-wise and application-wise, Ptch has not yet reached the limits of its potential.